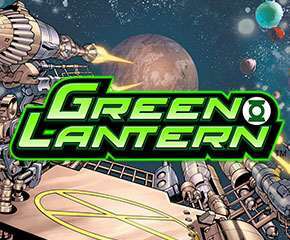 We all love watching Marvel’s superhero movies, Green Lantern is one of the Marvel’s superheroes created in 1940 and based on it is this exciting slot. NextGen is known to bring superheroes to slot game set ups. This slot game is a 5*3 matrix slot with 50 paylines. You can try it with a minimum of 50p per spin. Inspired by the Green Lantern Marvel comic that was also turned into a Hollywood blockbuster, this slot has a background of a galaxy with purple reels. 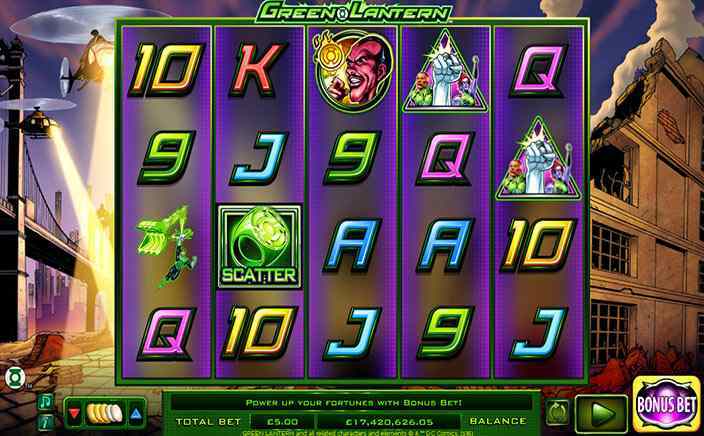 Green Lantern slots stand beside the reel and doing heroic deeds as you win. Regulate your bets to get started from the minimum of 50p to the maximum of £120 per spin. You must set the no. of paylines too or click “Bet Max” to set maximum bet from your side and all the lines will be activated. Now you are all set to spin the reels but if you don’t want to spin the reels use “Autoplay Feature” to spin automatically. This slot has something new for you which have two game modes. The first is normal mode and other is Bonus Bet Feature mode which will cost you extra 10 coins. The Bonus Bet mode is used to boost up the Ring Feature and win big prizes. All the high-value symbols are inspired from comic characters which include Green Lantern, Hector Hammond, Sinestro and two others with low-value symbols 9, 10, J, Q, K and A. The Wild symbol is the main character Lantern himself which appear only on 2nd and 4th reel and can substitute for all regular symbols except the scatter symbol which is the green ring. It doubles your win when appearing in the base game and quadruples in the free spin round. Free Spins: When the wild symbol appears on reel 2nd and 4th and the battery on reel 3rd then you will be awarded 24 free spins and a 4x multiplier. Ring feature: You must be playing in Bonus Bet mode to activate this feature. This costs a little extra but improves your Return to Player rate. Activated when 3 or more Bonus symbols appear on the reels and there are plenty of available prizes between 2 and 100 multipliers. Gamble Feature: Guess the correct colour and the suit of the card which will double or quadruple your win respectively but making the wrong guess will empty all your winnings. This slot can be played on any Smartphone gadget with the expected RTP of 95.54%. Bonus Bet Mode is recommended to be used to increase your winning odds. The graphics and sound effects of the slot are just marvellous.